*Please see below regarding pets. 3 bedroom holiday home, with 2 extra bedrooms and a bathroom separately downstairs (no internal access between floors). (Downstairs bathroom has toilet, vanity and cold water shower only.) Only 200m to the beach. Colourful and comfortable, with most of the comforts of home. GREAT for families, GREAT for relaxing. (Good for Mum too - the kitchen is included, but (Whangamata takeaways and supermarket are less than 10 mins drive away). 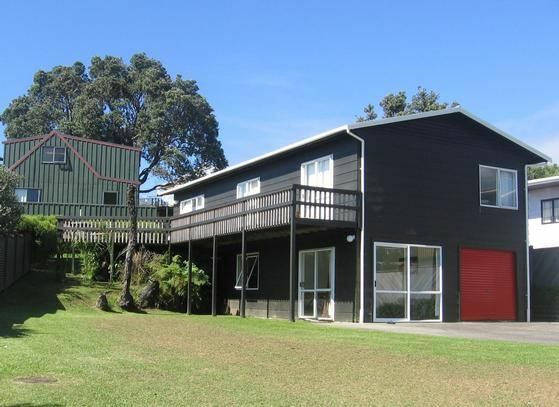 Onemana - close to Whangamata, but a whole world away. Plus its got tennis courts, a great beach, a cool pirate ship playground. Where is Onemana? Just north of Whangamata, easy 2 hour drive from central Auckland or Hamilton. Our place is kid-friendly with toys etc, but please remember its not totally kid-proof, no place is! *Well-behaved dogs are welcome with owner approval, sorry absolutely no cats. If dogs are to be included in the tenancy, please provide details of size and breed for owner to approve. Please note the photo of the beach is NOT taken from the property but is there to show off the great local beach. Please allow a minimum of 5 working days prior to any booking.There is a $75 administration fee and a security bond minimum of $300-$500, which is refunded after the tenancy provided the premises is left clean, tidy and undamaged. We also require 50% of the rent up front to secure your booking unless the booking is within the next 60 days then the full amount is due immediately. Check in time for peak is 2pm and checkout time is 10am. Check in time for off peak is 10am, check out 2pm, this could be subject to change if another booking overlaps. (Late checkout rates can apply). All applications are subject to us checking with the property owner before we can confirm your booking. Displayed here are the available times for this property given to us at the time of placing this advertisement. 2 night minimum stay. Family groups only. Rates poss negotiable for longer stays or very few people. Long weekends and Beach Hop - peak rates apply. Beach Hop must be for 4 plus nights pleas? Downstairs shower is a summer shower. Cold water shower only. Downstairs only with sink and toilet. Cleaning is offered for a$150. A lovely roomy bach style accomadation close to Beach. Large house in great location. Very close to the beach and added bonus of the spa and pool complex which was especially nice as we had rain. The house was upstairs downstairs it was a shame not to have internal access with the weather and we did find having to walk over grass to get to the upper level a little slippery. The house had everything we needed and plenty of beds. It’s a little tired in places but it’s a Kiwi Bach so all good. Our only gripe would be that it was not clean on arrival. We found the property very good, it had everything you needed plenty of room. We found the property very good, it had everything you needed plenty of room. This property was very close to the beach and was very clean an tidy. It would have been nice to have the down stairs room to have a path to the upstairs but it did not affect our stay. The smell that greeted us downstairs was unpleasant, and I found I had to leave a window open at night because of it. We also saw several cockroaches in the back bedroom and in the garage. Not sure if the website says there is no internal staircase, I would suggest some pavers from upstairs to downstairs would help. Clean but dated decor, sand in one of the beds. Smell is from storm damage, carpets are new & some airing will remedy that, cockroaches are common in this area, we live with them due to the sandy soil, nothing we can do, the site said sep. floors, but I have edited it to say no internal access between floors for futureproofing. Sand in beds, very confusing as you provided own linen, we don't inspect beds due to this. Thanks for the feed back. Great location, having downstairs unit was awesome for family with a newborn, all the essentials provided. The only thing we did note was that we prob left the property cleaner than we found it. We didn't end up staying due to bad weather conditions and flooding.